Dainty Amethyst Stone Earrings in Sterling Silver with 4mm Amethyst stud earrings - the perfect size for everyday wear. Beautiful 4mm stones are surrounded by a lovely Silver round bezel setting - little studs for your ears. All metal is Sterling Silver. 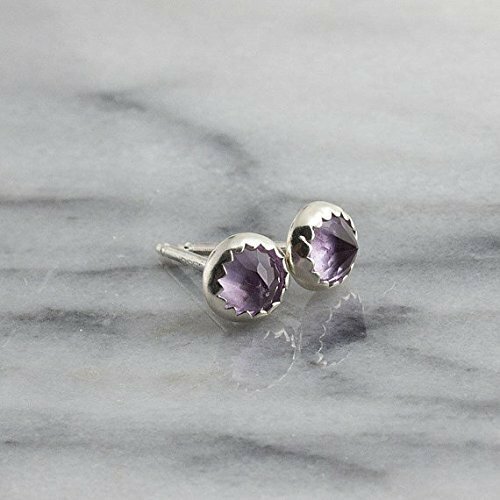 These delicate studs are made of Sterling and feature a tiny round 4mm Amethyst stone. Metal: Sterling Silver 925; Stone: natural Amethyst; Size: 4mm Please note pictures of jewelry are enlarged. The stones used in these earrings are natural.